“Can architecture feel, and know, and respond to their occupants? Might buildings begin, in primitive ways, to come alive?” Philip Beesley is a Canadian architect who is merging technology and art by creating near-living architecture. He creates interactive environments that move and breathe around its viewers. Depending on the number and activity of the viewers, glands emit scents, glass spines glove in response to movement and vibrations causes sounds of whisper to reach the viewer’s ears. The architectural environments copy the forms of nature and give the impression of something that is alive and has its own attitude. 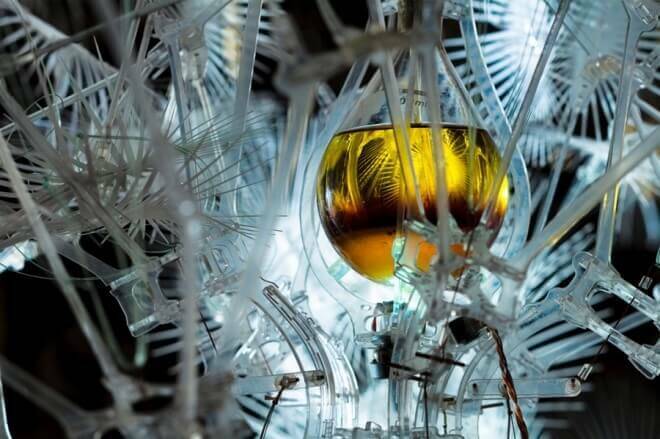 For more info about Philip Beesley and his collaborators' art, visit http://www.philipbeesley.com/.